Do you have the cutest kid? Is your son or daughter cute enough to grace the cover of Parents Magazine? I bet he or she is! I know your adorable little baby, toddler, preschooler or kindergartner is just the kid that could win. 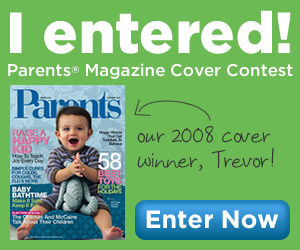 The Parents Magazine contest started April 1, 2009 but you have till June 24, 2009 to submit your child’s photo. To enter the contest, go to: Parents Magazine Cover Contest (3 mos – 2 yrs) and Parents Magazine Cover Contest (2 – 6 yrs). The two winners will appear on the dual cover of the November 2009 issue. Lose the hat and towel draped over the kid’s head – what are you hiding under there? Pictures with food on the face are cute on grandma’s refrigerator, but not so much for judges. Cranky faces are only for family members! Have your camera ready at all times and take tons of pictures—don’t edit yourself as you go along. So what are you waiting on? Go now and submit your pic and WIN! You can also win $10,000 in their Cover Kid Sweepstakes. I can’t wait to see Your child’s photo on the cover of the November issue of Parents magazine.